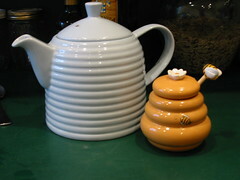 John Battelle calls them "honeypots". They are blog posts that get indexed high on certain search terms and get a lot of traffic long after they were written. I’ve got a bunch of them. Lately I’ve been getting a bunch of comments on my Best Rice Krispies Ad post from six months ago. Comments are generally correlated with traffic. So I decided to figure out why I am getting so much traffic to that post these days. 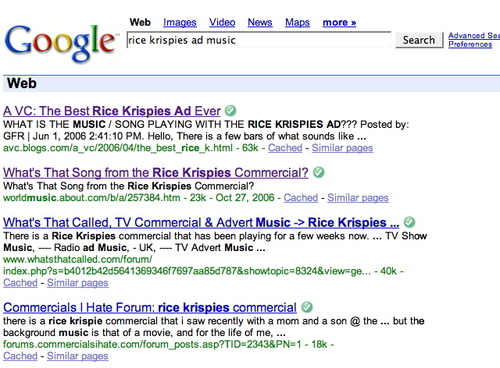 One search for rice krispies on Google explained it. A top link like that for a search term that is relatively popular will bring a lot of traffic. I’ve had five hits on that post in the past hour from Google. Not all of them are from that same search term, but they are all slight variations on it. Maybe there is something going on with a rice krispies ad that is causing a lot of people to search Google today. Who knows? 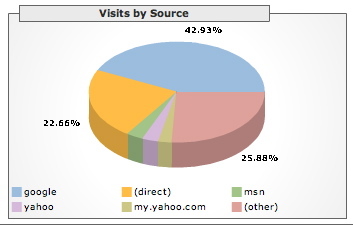 According to Google Analytics 43% of my web traffic (not feeds) comes from Google. Here’s the chart. I don’t know how much of that is truly search driven. I’ve seen people find my blog by typing AVC into google or fred wilson into google. I bet at least a third of my google traffic comes from people who don’t recall my URL or don’t want to be bothered typing it in. But I bet another third of my google traffic is going into honeypots like the rice krispies ad, the allen iverson post, the neil young post, my high school post (where I am above the high school’s own website), and a bunch of others. I am not sure that I turn many of the people who come to these honeypots into regular readers, but I am sure a few of them come back for more. In any case, I find the search/blog ecosystem fascinating and I think honeypots are an important factor that we should all pay more attention to.